Home > News > Sector > Commercial > The Dome’s the Limit! 29th Jan 2013 , Comments Off on The Dome’s the Limit! Innovative UK design and manufacturing company, Solardome Industries, invests in the future with the launch of its new SOLARDOME® PRO geodesic system. Despite tough economic times, cutting-edge and forward thinking Solardome Industries – an expert and world leader in small-scale aluminium geodesic domes – has just announced the launch of a new SOLARDOME® PRO professional dome system to extend their market scope beyond their current range of 3.5m-10m diameter. This innovative new system will allow the company to manufacture bespoke geodesic domes up to 25m diameter quickly and cost-effectively and also provides greater flexibility in design and possible dome applications; ranging across the domestic, commercial and educational sectors. required a 15m diameter dome, able to withstand high winds and extreme snow loads – five times that of the UK – to act as a force field to protect their three-story house and garden. 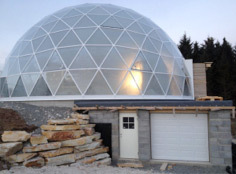 The dome will not only protect the structure of house, but will also dramatically reduce its heating costs. The project, due for completion this summer, is an ecologically sound “Grand Designs” project – on an arctic scale. A key part of the new SOLARDOME® PRO system has unique GEO-LOK nodal assembly – currently pending a patent application – which enables Solardome to quickly scale up any dome project between 10-25m using the same component design. It also creates a flexible system that is easy to build on site without the need for expensive or complex welding. Another key advantage to the new SOLARDOME® PRO system is that it can be clad with any type of material meaning that the customer can specify their exact requirements; whether it be for a single glazed tropical biome, a double glazed skylight or a part insulated, part glazed dome building. This new system opens up a huge market potential and offers a flexible, eco-friendly, durable and free standing alternative to traditional buildings. One of the potential markets for this larger dome system is in schools as a unique and inspirational option to the regular teaching environments. The dome could be used as anything from a performance studio or canteen through to a contemporary and permanent alternative to a portakabin. Comments Off on The Dome’s the Limit!